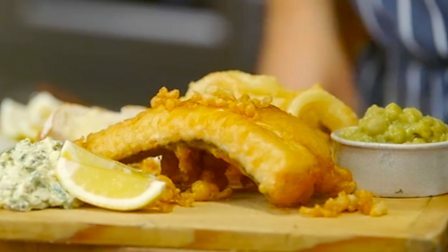 James Martin takes on the chip shop with his delicious deep-fried fillets of hake in beer batter – with mushy peas of course. For the mushy peas, soak the peas in a large bowl, in three times their volume of water for at least 1½ hours or, if you have the time, overnight. Drain the peas, rinse under the tap, and place on the stove in a large pan and cover with the water. Add the bicarbonate of soda. Cover and bring to the boil and once boiled, reduce the heat and simmer the peas for 1½-2 hours, stirring from time to time. The peas should be soft and mushy in texture but not too dry. If they are wet, continue cooking over the heat with the lid off to dry out a little. Beat in the butter and season with salt and pepper. For the beer battered hake, combine the flour, yeast, salt and sugar in a bowl. Add the beer and vinegar and whisk until it forms a thick batter. Set aside to ferment for about 30 minutes. It is ready to use when the mixture starts to bubble. Dip each piece of onion into the batter to coat thoroughly. Cook them in batches in the fat fryer, and cook for 2-3 minutes until golden-brown and cooked through. Dip each piece of fish into the batter to coat thoroughly. Lower them carefully into the fryer, and cook one at a time. Cook for 4-6 minutes until the fish is cooked through and the batter is golden-brown. Drizzle the remaining batter into the fat to make scraps. Butter the bread with the softened butter and cut in half. For rapeseed tartare sauce, whisk together the egg yolks, mustard and vinegar in a bowl or small processor. Still whisking, start adding the rapeseed oil very slowly to make a mayonnaise – the mixture should be thick and light once the oil is incorporated. Stir in the capers, gherkins, shallot and herbs. Season with salt and pepper and a touch of lemon juice. To serve, place the fish on plates, with a spoonful of mushy peas alongside. Pile the bread and butter next to it and finish with a squeeze of lemon juice and spoonful of tartare sauce.